Federal snipers with the Bureau of Land Management (BLM) trained guns on members of a family yesterday after they dared to stop and take video footage of cattle outside the bounds of a designated “First Amendment Area,” before arresting one of the men for non-compliance. The cattle were being rounded up by BLM officers as part of a crackdown on Nevada rancher Cliven Bundy, who has refused to pay “grazing fees” demanded by the feds as a result of a re-classification of 600,000 acres of federal land in northeastern Clark County which Bundy claims has been in his family for generations. Some fear the dispute could turn into a Ruby Ridge-style violent standoff because Bundy has said he is prepared to become a martyr for what he perceives as a constitutional stance against tyranny. As we reported earlier, the feds have now started rounding up Bundy’s cattle in the name of protecting a supposedly endangered species, the desert tortoise, forbidding Bundy from interfering or even entering the vast area. The case is quickly turning into another iconic battle between big government and a besieged family. 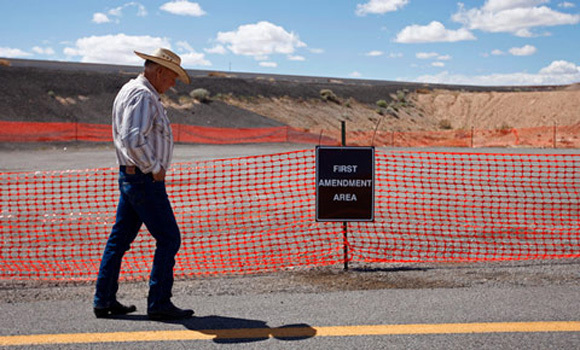 Fears that the confrontation may turn violent and concerns that Bundy is drawing increased support from liberty activists and the local community prompted the feds to tape off two ridiculous “First Amendment Areas,” outside of which free speech in support of Bundy is banned. A sign placed inside the area reads “Welcome to Amerika – Wake Up” alongside a hammer and sickle logo. When Bundy’s family members violated that rule yesterday in an attempt to peacefully document the cattle roundup, they were met with a barrage of loudspeaker warnings and four BLM snipers with their guns trained on the dissenters. None of the family members were armed, but as soon as Dave Bundy began filming the cattle in the distance, 11 BLM vehicles each with two agents arrived and surrounded him. “They also had four snipers on the hill above us all trained on us. We were doing nothing besides filming the area,” said Ryan Bundy. The family were told to leave the area via loudspeaker because they had violated the crudely established “First Amendment Area”. “They said that we had no first amendment rights except for up by the bridge where they had established an area for that,” Bundy said. When Dave Bundy didn’t immediately heed the warning and return to his vehicle, a dog was set on him and he was subsequently arrested. When Dave Bundy’s father Cliven attempted to contact emergency response in both Mesquite and for Metro in an attempt to discover the whereabouts of his son, he was told to, “get off the phone or he would be arrested,” according to Ryan Bundy. Should the Bundy case escalate any further, what has up to this point remained a largely local news story threatens to explode into a national controversy – re-igniting resentment over big government and a federal bureaucracy increasingly trampling on the rights of the American people to be left alone. Though this article does not contain enough factual information about Cliven Bundy’s grazing rights, if any; the events & circumstances leading up to Dave Bundy’s apparent false arrest should be a wake-up call to all Americans. The US is the most over-legislated and over-regulated country in the world. The US also has the highest prison population of any country in the world. Considering only this much, either America is completely overrun with criminals or almost everything Americans eat, wear,do or say is against the law or violates some regulation. The most outrageous part of the incident is that federal snipers had their guns trained on the Bundy family. One has to wonder what any of the Bundys would have had to have done to provoke the snipers to open fire on them or any American. Please consider that the government is downsizing the military while it is rapidly increasing the size and heavily arming Homeland Security Forces and other government personnel. Members of the armed forces are willing to fight and even die, if necessary, to protect all Americans and American freedoms. Homeland Security’s primary function is to protect the government and a prerequisite of their service is to fire on and kill American citizens.